In any event, he pointed me to a band from the 1970s that went by the name of Icarus. 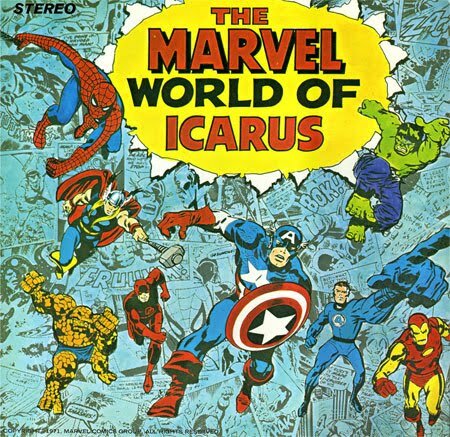 All of the members were big Marvel fans and produced a Marvel-themed album called, straight-forwardly enough, The Marvel World of Icarus. I did a bit of digging and found that it crops up in blogs from time to time as people discover a copy at a yard sale or record shop or what-have-you. Sometimes, they'll include a bit of background about how there was a bit of legal scuffle over the thing and the album was pulled almost immediately after release, which owes to its obscurity. Occasionally, they'll make some vague references to the 1970s prog rock vibe all the songs have. The album was re-issued in 2007 with five more songs than the original record contained. The CD is available from Amazon. Personally, I really like the nine songs I've heard thus far and am definitely interesting in adding the full album to my MP3 player. 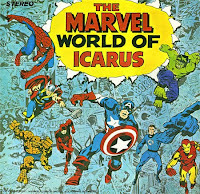 Icarus was the ORIGINAL group..first to use the name chosen in a FAB208 comp..
WORLD OF ICARUS was PLOTEL TWINS- STEVE HART- NORRIE DEVINE- PETE CURTAIN and FRAZER HINES narrator! I have all contracts for writing, mechanicals..the CD is continuously released...yet in this corrupt world not a cent in royalties paid to us. BTW it was released with MARVEL and STAN's blessings. Back in London, Etheridge briefly worked with the Deep Purple offshoot Warhorse, followed by a stint with Icarus, during the final stages of recording their album The Marvel World Of Icarus. He recalled "I'd been on the fringes of the London rock scene for a couple of years, and one of the musicians I came across was [Icarus woodwinds player] Norrie Devine. I desperately needed somewhere to live, and he put me in touch with Peter Curtain." Curtain, also the drummer for Icarus, set Etheridge up with a flat and offered him a spot in the band after their guitarist left. Though the album sleeve credited Etheridge for all the guitar parts, in fact only one track featured him as the sole guitarist, though he did overdubs on several other tracks. He stayed with Icarus for their subsequent tour of Romania, which ended abruptly when President Nicolae Ceaușescu ordered the band to be deported, and proved to be their final public appearance.